Ready to start a blog? There are several platforms you can use. Base your choice on how comfortable you are with technology in general and how much customization or features you need. Several social media sites have features that lend themselves to “long form” blogging. Facebook, Tumblr or Squidoo, for example, are all suitable for blogging if all you want to do is just post or share with other SM sites and don’t mind the limited features and customization. If you do want to move up, usually the only way to get your posts is to copy them and save them to paste into a new platform. You may lose the original publish date if your nest platform doesn’t allow date changes and you may have to remove the content entirely from the original site. Some only allow your post to be published exclusively on their site – and no where else. Most of these sites aren’t the most professional venues for blogging, however. But since they’re typically heavily trafficked and easy to use, they’re a good place to start. The biggest advantage to a community hosted blog is that everything is installed, configured and backed up for you. Plus, being on a heavily trafficked site, you’ve got some built in SEO benefits right off the bat. 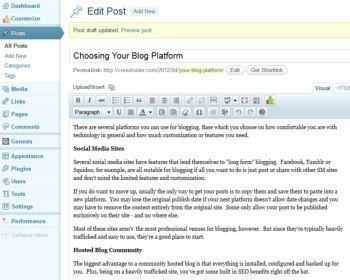 Blogger and WordPress.com are two blogging communities that let you create an account and set up your own blog for free. The two platforms are very similar. Below are a few of the key differences to help you decide. But in general, if you want more customization and future “scalability”, choose WordPress. Both allow a certain degree of site customization but Blogger, run by Google, leaves a lot of that up to you (finding plugins, widgets, designing templates, and so on). WordPress.com offers hundreds of templates to choose from (some customizable) and has most features you need built in or available as easy to add on plugins and widgets. If you think you may want to host the blog yourself, choose WordPress since it’s much easier to transfer your blog to WordPress installed on your own server. You can port Blogger but it’s more difficult with quite a bit of tweaking required. Since Blogger is owned by Google, there might be some additional SEO benefits and built in integration with other Google applications like Google Plus. If you decide on a blogging community, you’re going to end up with a URL that incorporates the community name and your user name. For Blogger, the standard format is mycompany,blogspot.com. For WordPress, it’s mycompany.wordpress.com. If you want to hide the default URL, you’ll need a domain name (not the one you use for your website) and point it to the default URL for your blog. Don’t turn on cloaking – the option that completely hides the default URL from users. Cloaking will also hide your site from search engines. But since cloaking is off, once users are on the site, they’ll still see the default URL. So if hiding the default URL is important, use WordPress.com since it offers an advanced (paid) feature for custom domain names. Users will only see your domain name and there will be no SEO issues as there would be for cloaking. If available, use a domain name like mycompanyblog.com. If you’re already using a hosting account for your website, most hosting services let you install WordPress. While the installation is usually automatic (select the application and click install), you’ll still need to configure and customize WordPress yourself. That means you’ll need to find plugins and widgets that provide the additional functionality (social share buttons, social feeds, polls, etc…) you want. You’ll also need to keep the application and all your plugins up to date and back up your site. Updates are usually fairly easy – and so is back if you use a backup plugin. As for the URL of your blog, you can create a subdomain, e.g., blog.mycompany.com and point that to the folder where WordPress is installed. If you don’t have the ability to create subdomains, you’ll need to use the folder path to WordPress for your blog URL, e.g., mycompany.com/wordpress. There isn’t always an option to change the folder name of where WordPress is installed with an “automatic” installation. But you can download the WordPress application yourself and install it in a folder of your choice. That way, you’ll have control over the folder name. A common practice is to name the folder, “blog” – so the URL would be mycompany.com/blog. Instructions on downloading and installing WordPress in your own folder are available at the WordPress.org site. It’s not really that difficult to install or maintain. WordPress.org has an enormous help/support section and there are numerous sites on the web and books for guidance. Or, hire someone to set up and maintain the site. You just provide the posts. Here are some sources for self-hosting.